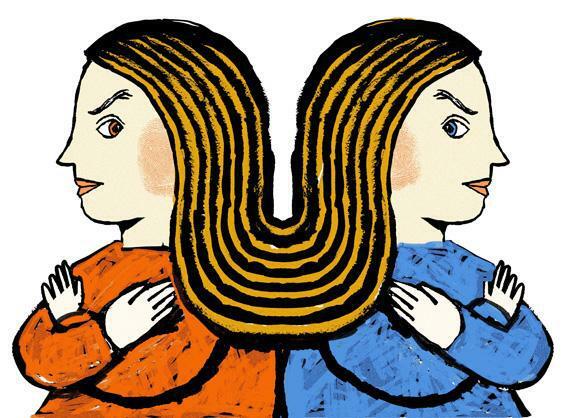 Frank Bruni's New York Times column on sibling love misses the dark side. The dark side of sibling love. With the publication of Frank Bruni’s most emailed, much admired ode to sibling love, we seem to have found ourselves in another warm American moment that excludes or reproaches many people. When it’s great, there is nothing more transcendently close or comforting than one’s relationship with one’s siblings, but what Bruni didn’t get into is that it can also be a volatile and dangerous form of love. Like Bruni, I am lucky enough to come from a big brood. I am very close to two of my sisters, and don’t know what I would do without them. But when I had a baby on my own, in challenging circumstances, one of my other sisters did not want to meet him. Our relationship had been extremely strained since before I was pregnant, but I thought she might want to see her nephew, in the ritual way one sees a new baby. She lived, at the time, in the duplex upstairs from us, but she did not come down to hold him. She did not send a onesie with airplanes on it or a bear. She and her husband and daughter did not come to the party I had in my garden to welcome him to the world. She, in fact, did not meet or look at him for five months. That’s how much she hated or resented me. In the last weeks of my pregnancy, several friends offered to drive me to the hospital or watch my daughter if there was an emergency because they knew that I was alone, and my sister, who lived upstairs and had a car, was not on friendly enough terms to drive me to the hospital. Very late at night, I considered the possibility that those people who you would call in the middle of the night to drive you to the hospital or to watch your other child if something went wrong are in fact your family. When we got home from the hospital my 6-year-old daughter would ask every day why her aunt had not come to meet our baby. My first instinct was to lie, to protect the idea of family love winning out, to smooth over, to make things normal for her, but there was no way to do this for five months. In the end, I think she learned that your siblings, or at least sisters, may or may not show up for you when you need them. Of course I was struck in particular by Frank Bruni’s line about his siblings: “For each of us, a new home, a new relationship or a newborn was never quite real until the rest of us had been ushered in to the front row.” But of course, even if your sister does not show up the newborn will still crush up his face and cry when he is hungry; he will still find a way to be real. And even though we tend in America to get pretty oppressed by traditional ideas or fantasies about these things, you can still make or find a family for him. Later, when Vanessa had a baby, both Virginia and Vanessa’s husband, Clive felt like they weren’t getting enough of Vanessa’s attention. In the difficult period that followed Virginia began a sort of affair, with Clive that was incredibly painful for Vanessa. The two sisters salvaged their relationship, and were closely attached to the end, though the episode remained, huge and looming, beneath the surface. (One way they managed, which is arguably a good way to manage siblings, was that they were English, so they just didn’t talk much about it.) The thing one learns from these two high strung women is that the intensity or intimacy or possessiveness of the sibling relationship is amazing, well, until it’s not. The familiarity, the closeness, the seduction of a shared childhood carries within it a lot of dangerous things; the wonderful elements of siblings co-exist with the very awful ones, they are entwined, inseparable. And whether it works like Frank Bruni’s clan, or doesn’t, there is no point in an overly rosy or Hallmarkish view. Now my sister is living happily ever after with her corporate lawyer husband in a world that is fortunately very different from my own; we are freed from the thwarted expectations of shared history. You can fight forever over a game that was played decades earlier, or a half remembered argument in a bedroom with elephant wallpaper in a house that was sold long ago, or you can walk away. Part of the problem may be that the thing you suspect as a child—that there is not enough love to go around—is true. Attention is finite. The scramble is forever. The secretly suspected truth that you are not equally admired or adored or attractive, that there will be insoluble inequities, that one will have a more interesting career, and one will be happier in love, and one will have better adventures, and one will be more creative, and one will be more charming, and one will have more shoes is all true. The myth parents foist, with good intentions, on children—that the resources and embrace of the world will be equal—will not be borne out by life. You knew it when you were 4. The yellow lollipop is not the same as the red one.